"Still the crude but charming plod-along it always was"
The ‘updated’ version of Honda’s bum-basic commuter only needed a few upgrades over the original 1960’s design – CDI ignition is the main benefit, reducing maintenance. Otherwise, it’s still the crude but charming plod-along it always was – only emissions killed it off in the EU, variants of the Cub are still on sale in Asia. Again, the C90 Cub’s chassis isn’t built for speed – all it does is connect the wheels, engine and rider. 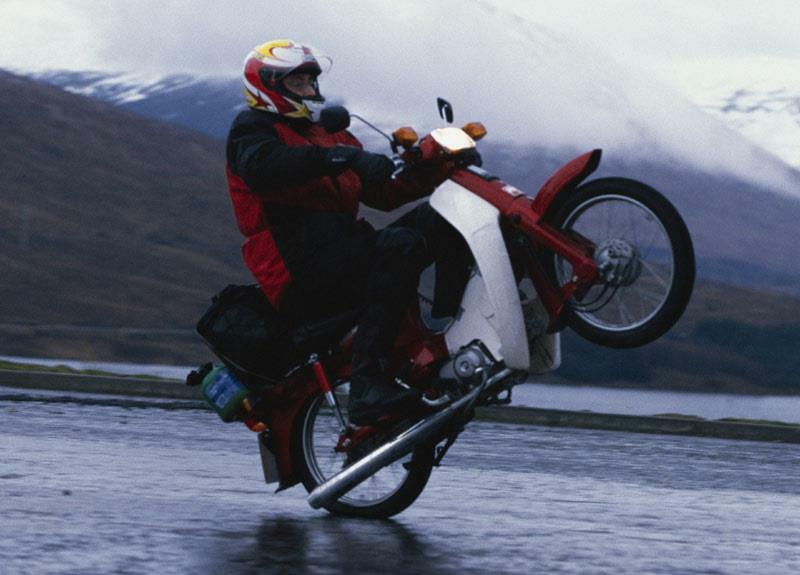 The leading link forks rise under braking, and even with the standard drum brake the unloading of the front wheel can lead to a crash on slippy surfaces. But treat it as a commuter rather than a sports bike, and it’ll comfortably carry you about town – the suspension and full-size wheels give a much more comfortable ride than a scooter. The C90 is slow. Breaching a real 50mph is good going, and the semi-automatic three-speed gearbox’s high ratios are good for fuel consumption, not acceleration. But it does what it needs to – gets from A to B simply, cheaply and reliably. The heel-and-toe clutchless gear change is easy for a complete novice to understand, and doesn’t mark your shoes either. The C90’s build is simple – a handful of tools will cover most maintenance tasks, though the robust nature means little repair is needed.  The pressed steel chassis is prone to rust on old, neglected or high miles bikes around the rear wheel arch – check it hasn’t got near the rear suspension mounts. The swingarm is susceptible to rust too, the header pipe rots and the wheels can give out – all of which are easily inspected, preventable or curable, so you can afford to be choosy when buying. The engine should need little more than faithful oil changes (it can easily burn through the tiny capacity) and valve clearance checks. In the current harsh economy, the C90 will win a lot of friends. 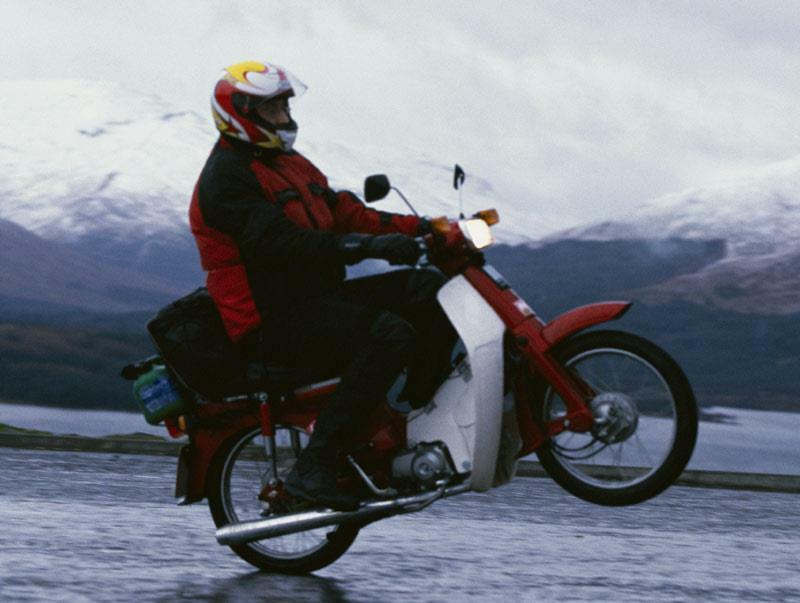 They cost little to buy, insure, fill with fuel, service or repair – there’s no reason a C90 will ever leave you out of pocket, and as long as you accept it’s built for one purpose, you’ll be happy with it. A complete bike in any state rarely fetches less than £100 – you can really run them in to the ground and still sell them on. 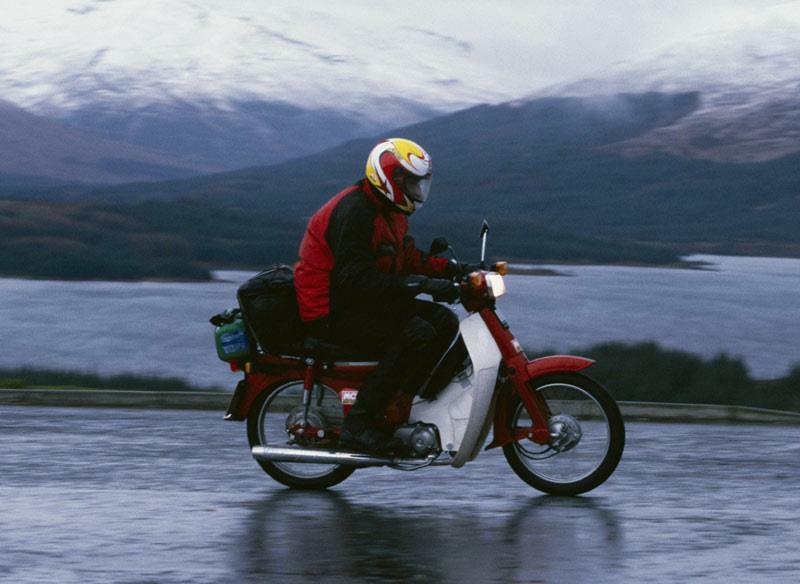 Find a Honda C90 for sale. 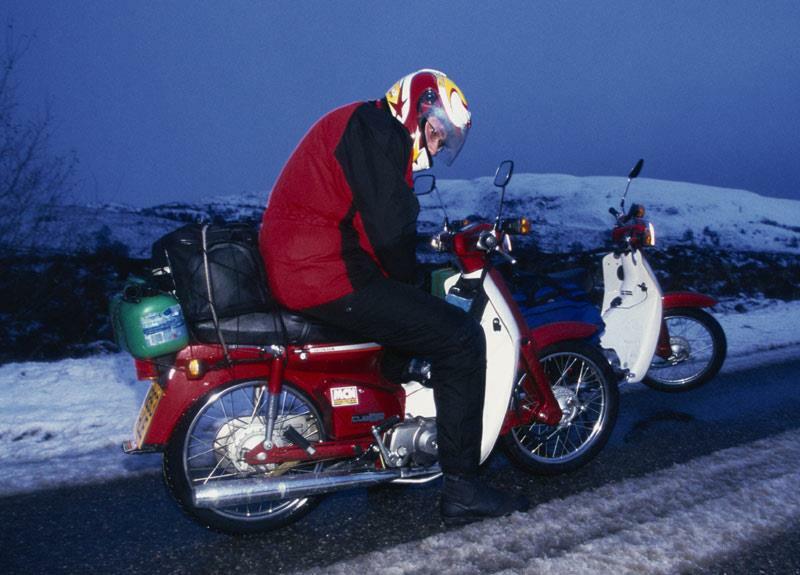 There is very little too a C90 – leg shields, a fuel gauge and a decent seat are the extent of the luxuries, but then it is built to do a simple job on the cheap. Owners often add screens, top boxes and boards for the taxi driver’s ‘Knowledge’ – if you want any of these, it shouldn’t be a problem finding the spec you want. 1984: New model. Cub has new engine, chassis and styling compared to earlier C90s. Unchanged throughout model life. 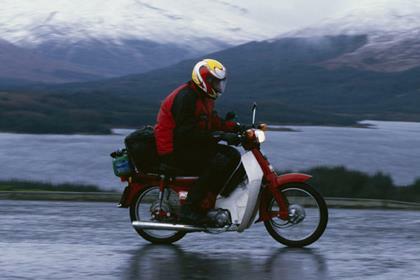 Honda C90 Cub E/S: Introduced in 1985, the E/S is identical except for an electric start. There’s no real advantage to having it – the kick start is easy to use, so only the truly weak should seek one out. Performance suffers slightly because of the need for a bigger flywheel to charge the larger battery (which is more crucial to keep charged – a standard bike doesn’t really need a battery to run. 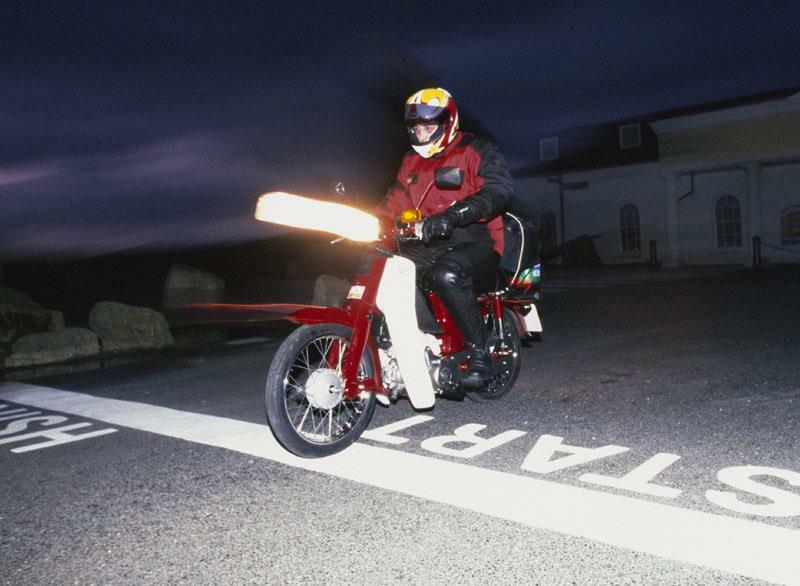 3 owners have reviewed their HONDA C90 (1985-2002) and rated it in a number of areas. Read what they have to say and what they like and dislike about the bike below. bought it privately and completely restored it. it could be a bit faster, a bit higher, a bit smarter - but hey? the c for cub stands for cheap urban bike. and this is exactly what the bike is. a nice cheap urban bike. it managed to carry me nonstop 100 miles. so no problem at all. however for a trip through Europe i would rather take a bigger one. the engine does what it should do. taking the bike from A to B. in the city the bike is as quick as any other one. First of all I have to agree with part of the review given on the C90. It is very basic, the suspension and breaking are bad and it is slow. But wasn't that the point all along? I owned by C90 for 13 months and rode it to work every day. My total expenditure for that time was £15 on one oil change. Nothing else. Petrol was about £3 for 10 days of riding. I reckon I was getting near 130mpg out of it. For the money you pay for a C90, you can't expect much and yet you get so much in terms of reliability. I left my C90 standing for more than a month when I upgraded to a CB500 and it started with no problems by using the kickstart. My only complaints were the front suspension and the front drum brake. Also, it always felt that it could have done with a fourth gear. Then again, that would be the Honda Innova. All in all it was an excellent bike which I will buy again the moment I have my own garage to put it in. Peace of mind was the greatest thing this bike had to offer.